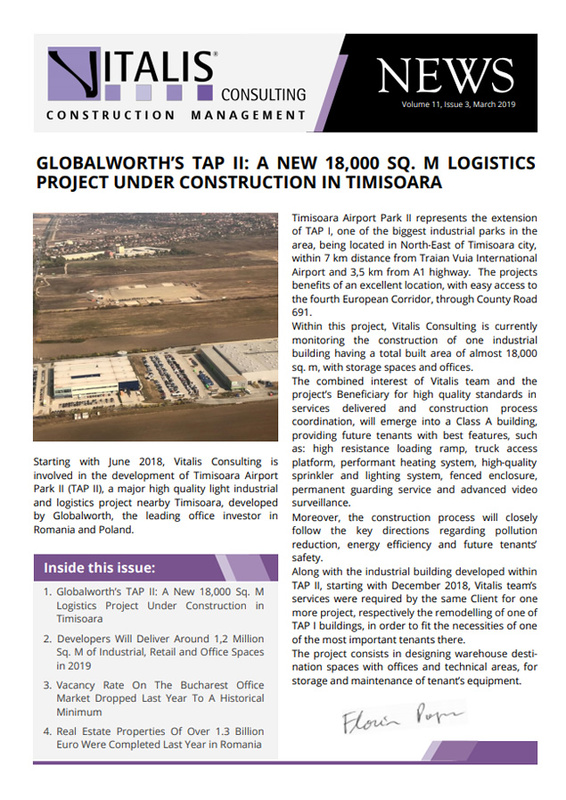 Starting with June 2018, Vitalis Consulting is involved in the development of Timisoara Airport Park II (TAP II), a major high quality light industrial and logistics project nearby Timisoara, developed by Globalworth, the leading office investor in Romania and Poland. Timisoara Airport Park II represents the extension of TAP I, one of the biggest industrial parks in the area, being located in North-East of Timisoara city, within 7 km distance from Traian Vuia International Airport and 3,5 km from A1 highway. The projects benefits of an excellent location, with easy access to the fourth European Corridor, through County Road 691. Within this project, Vitalis Consulting is currently monitoring the construction of one industrial building having a total built area of almost 18,000 sq. m, with storage spaces and offices. The combined interest of Vitalis team and the project’s Beneficiary for high quality standards in services delivered and construction process coordination, will emerge into a Class A building, providing future tenants with best features, such as: high resistance loading ramp, truck access platform, performant heating system, high-quality sprinkler and lighting system, fenced enclosure, permanent guarding service and advanced video surveillance. Moreover, the construction process will closely follow the key directions regarding pollution reduction, energy efficiency and future tenants’ safety. Along with the industrial building developed within TAP II, starting with December 2018, Vitalis team’s services were required by the same Client for one more project, respectively the remodelling of one of TAP I buildings, in order to fit the necessities of one of the most important tenants there. The project consists in designing warehouse destination spaces with offices and technical areas, for storage and maintenance of tenant’s equipment. The local real estate market has entered a new year of development on all its major segments, as investors plan to deliver industrial, retail and office spaces with a cumulated area of ​​1.2 million square meters, a new market record. In comparison, new spaces of around 850,000 square meters were delivered in 2018. The positive evolution of the development activity comes from the sustained demand from tenants over the last three to four years, as pre-leasing contracts have been signed for more than half of the new spaces that will be delivered this year. The total retail stock exceeded 3.7 million square meters at the end of 2018, almost similar to the office one, while the industrial & logistics stock was of around 3.5 million square meters. It is expected that circa 600,000 square meters of industrial and logistics space, over 400,000 square meters of office space and 200,000 square meters of retail space will be delivered in 2019. In regards to Bucharest, around 300,000 square meters of industrial space and 300,000 square meters of office space will be delivered. New retail spaces will be delivered this year in Sibiu and Timişoara. Between 2015 and 2018, the local retail market increased by almost 40% while the dominant shopping centers constantly had an occupancy rate of almost 100%. In Bucharest, new office buildings with an area of ​​about 500,000 square meters are currently under construction, while office projects with a cumulated GLA of 300,000 square meters are expected to be delivered by the end of 2019. 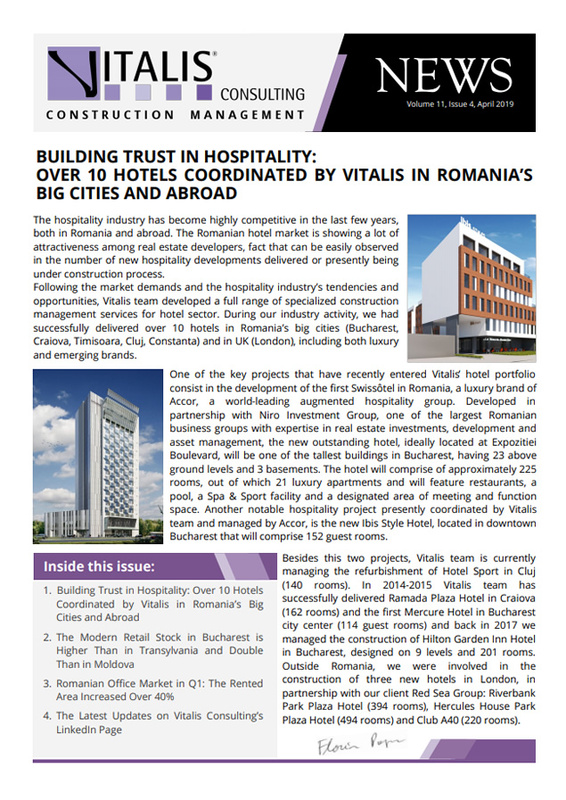 The office buildings sector is developing in other major university centers, such as Timisoara, Cluj-Napoca, Brasov and Iasi, as new buildings with a total area of around 130,000 square meters will be delivered this year. After a stagnation period of six years (2009 – 2014), the industrial & logistics sector has also resumed its growth in 2015 and will reach a peak this year, when developers are planning to build new warehouses with a GLA of ​​around 600,000 square meters. The vacancy rate on the Bucharest office market dropped last year to a historic minimum of about 6,6%, compared with 9.2% at the end of 2017. The decrease occurred on the background of a lower development activity compared to the demand of office space. Thus, last year, developers completed new office projects totalling 145,000 square meters, as the surface leased through real estate consultants was 335,000 square meters, of which 45% (150,000 square meters) represents new demand (pre-leases, new contracts, extensions of existing surfaces and relocations from other buildings than Class A and B buildings). If we also consider direct transactions between tenants and landlords, the leased area far outstrips the new offer put on the market by developers. In addition, some of the spaces delivered in 2018 were already contracted from previous years. Even though there are significant differences between the 12 office sub-markets in Bucharest in terms of office space available, the vacancy rate continued to decline in 2018 to a historic minimum, amid a relatively modest development of activity in 2017 and 2018. Net demand remained at comparable levels over the past two years, around 150,000 square meters, absorbing the new offer, according to specialists. Thus, the fewest available spaces are in the Center-North, Floreasca Barbu-Vacarescu, Center, Center West and CBD areas, where the vacancy rate is below 5%, while in the Baneasa and Pipera Nord are located most of the empty spaces. The prime rent in Bucharest continued for five years in a row at the level of 18.5 euro/ sq. m /month, with changes being recorded at the level of the incentives packages offered by the landlords. In 2019, if all the announced projects are completed, the stock will grow by about 300,000 square meters, of which 50% is already pre-leased. The areas with the lowest vacancy rates will also benefit from the highest deliveries this year, so two large projects, totalling more than 40,000 square meters, will be completed in Floreasca - Barbu Vacarescu, the CBD will increase the stock by 30,000 meters squares, and in the West-West are announced three projects with a total of over 80,000 square meters. According to real estate specialists, the positive evolution of the local real-estate market brought over 1,425,000 sq. m GLA of new retail, office and industrial completions last year in Romania. The market value of these properties is estimated at over 1.3 billion Euro, marking a 21% annual jump. The main source of growth came especially from the industrial sector where completions were 63% higher than in the previous year, but there was also registered a hardening yields’ evolution in prime properties. Approximately 38% of the total value of 1.3 billion Euro is represented by new office buildings, followed by industrial new stock that represents 36% of total value and retail deliveries (shopping centres, retail parks, big-box units) totalling 26% of total. New offices of over 255,000 sq. m GLA were delivered last year at national level, with top locations being Bucharest (150,000 sq. m GLA) and Timisoara (53,000 sq. m GLA). The total value of office deliveries is estimated at 504 million Euro, with an average rent that varies in between 11-15 Euro/sq. m/month and an average yield of 7.5-8.5%. The industrial sector recorded its best ever evolution in 2018, with over 900,000 sq. m GLA delivered at national level, marking a 63% annual jump. Bucharest was the most effervescent market with 360,000 sq. m completed, followed by Timisoara (103,000 sq. m), Pitesti (68,000 sq. m) and Cluj-Napoca (61,400 sq. m). Retail openings totalized 270,000 sq. m GLA last year, including new shopping centres of 43,600 sq. m GLA, new retail parks of 107,500 sq. m GLA and big-box retail warehousing of 119,000 sq. m GLA. Last year’s main change was the significant jump in retail parks development pace, the new stock being more than triple as compared with 2017. Retail properties’ value is estimated at 340 million Euro, representing a 4% increase as compared to 2017.